Chase Hall (right) on the University of Nebraska–Lincoln's East Campus is home to the Biological Systems Engineering Department. Three of the 17 agricultural technology projects recently funded by the USDA are led by researchers in this department. Lincoln, Neb. 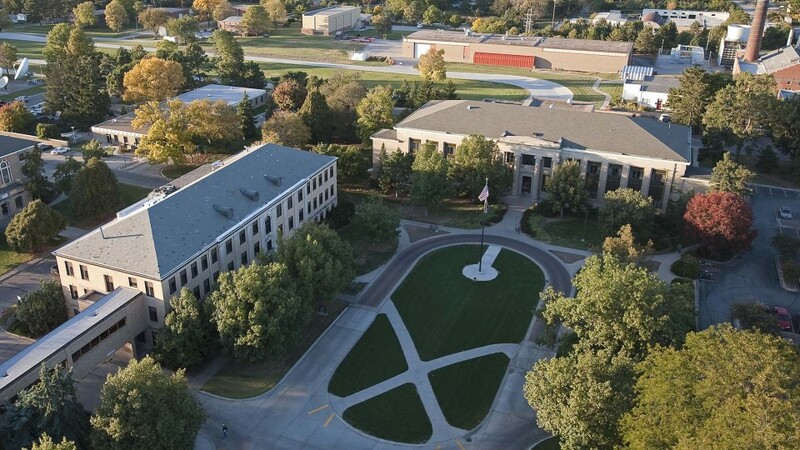 — The next generation of agricultural technologies and systems to meet the growing demand for food, fuel and fiber is the focus of three USDA-funded research projects within the Biological Systems Engineering Department at the University of Nebraska–Lincoln. The projects were announced Oct. 17 by the National Institute of Food and Agriculture’s (NIFA) Agriculture and Food Research Initiative (AFRI). The projects focus on high-resolution depth sensing of soils, next-generation spray drift mitigation and variable rate irrigation technology. Work in these areas has already been established and with support from AFRI, Nebraska researchers can continue to develop these technologies. Assistant Professor and Advanced Sensing Systems Engineer Yufeng Ge was awarded a three-year $499,896 grant to develop an instrumented soil penetrometer for gathering real-time and simultaneous prediction of a number of soil properties. This will be achieved through novel modeling algorithms that will relate in situ sensor data to lab-based VisNIR (visible and near infrared reflectance spectroscopy) spectral libraries. While several technologies are currently available to characterize the variability of soil in the lateral dimension, the technology to obtain high-resolution soil data along the profile is not readily available. This goal of this project is to fill in that technological gap and deliver high-resolution, low-cost depth-wise soil data. As part of the research, the sensing system will be field tested rigorously in Nebraska, Texas, and Alabama, with soils covering a wide range of climate, parent material and management practice. Clay content, organic matter, water content, bulk density and cation exchange capacity will all be studied in the project. The fusion of data from different sensor modules will also be investigated to ensure quality control and fault-detection when no prior information is available for new soils. Ge is working with graduate students Nuwang Wijewardane and Ujjwol Bhandari, research technologist Tyler Smith, and soil scientists Christine Morgan (Texas A&M University) and Jason Ackerson (Purdue University) on the project. Research led by Joe Luck, associate professor of biological systems engineering and precision agriculture engineer, is focused on reducing negative impacts to society and the environment resulting from spray drift of pesticides. The four-year, $499,916 project will introduce next-generation technologies for controlling spray droplets during field applications. Current technologies to reduce off-target spray, including fixed orifice air induction nozzles, spray shields and adjuvants have seen little development over the past decade. This project builds off of previous research conducted by Luck and will combine field deployable, real-time weather monitoring with novel nozzle control technology to affect spray droplet sizes during field applications. Reducing off-target spray drift from agricultural settings is a primary goal of the U.S. Environmental Protection Agency. Successful completion of this project would result in stimulation of research and development in nozzle technology where significant advancements in the field of drift reduction technologies would occur. “As we continue to see more interaction between rural and urban landscapes, we’re going to have to do a better job of keeping ‘ag applications’ within respective field boundaries,” said Luck. Spray drift issues were a hot topic with crop producers in Nebraska this year because of dicamba. An estimated 500,000 acres of dicamba-tolerant soybean were planted across the state, but some broadleaf crops sensitive to the herbicide were damaged due to drift. In addition to Luck, Nebraska’s Santosh Pitla and Greg Kruger are also working on this project, along with Michael Sama from the University of Kentucky. Advancing variable rate irrigation technology across the Great Plains and the Midwest through improved water efficiency of irrigated, row crop agriculture is the focus of a three-year, $499,978 grant awarded to Christopher Neale, professor in the Biological Systems Engineering Department and director of research at the Robert B. Daugherty Water for Food Global Institute at the University of Nebraska. The innovative project will allow a team of engineers to fly drones over crops at the Eastern Nebraska Research and Extension Center near Mead, Nebraska, and collect large volumes of data using advanced remote sensing systems and in-field sensors. The research will study the integration of technical systems and information technology to assist complex, variable rate irrigation decisions in typical large crop production areas and growing seasons. “This funding recognizes the ability of the University of Nebraska and the Daugherty Water for Food Global Institute, to lead this potentially game changing research,” said Neale. “We have a looming challenge of feeding a growing world population expected to reach nearly 10 billion by the year 2050, effectively doubling the demand for food, and we will need to use every tool and opportunity available to rise to this challenge,” he said. The results of the research are expected to advance and accelerate the adoption of UAS technologies, simulation models to information irrigation management and definition of a prescription for variable rate irrigation technologies. This will allow producers to respond quickly and more accurately to soil conditions, increasing crop production while maximizing their water use efficiency. Others from Nebraska working on the project are Wayne Woldt, Derek Heeren, George Meyer, Joe Luck, Yufeng Ge and Daran Rudnick, along with postdoctoral researchers Burdette Barker and Geng “Frank” Bai, and graduate students Mitch Maguire and Sandeep Bhatti. To watch a video about this research project, visit https://youtu.be/_S1hTfel_5Y. AFRI is America’s flagship competitive grants program for foundational and translational research, education and extension projects in the food and agricultural sciences. AFRI’s agriculture systems and technology grants support the design and engineering of agricultural production systems and research on the burgeoning field of biomass, biofuels, feedstock, bioenergy and bio-based products.